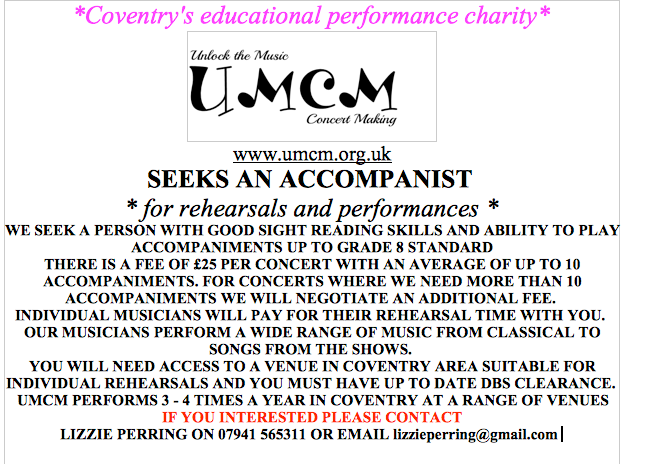 Between Us and Craig Holmes and the Sax Quartet are holding a fundraising concert in aid of UMCM. 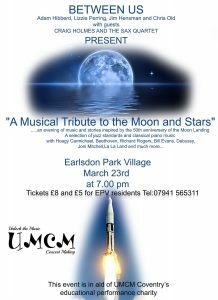 The event takes place at Earlsdon Park Village on Saturday 23 March at 7pm, and celebrates the 50th anniversary of the moon landings (was it really that long ago?) including songs and pieces about the moon and stars. Tickets are £8 full price and £5 for residents. 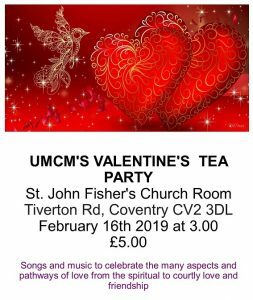 UMCM’s programme of events starts early this year with a Valentine’s Day Tea Party in the Church Room at St John Fisher Church, Tiverton Road, Coventry CV2 3DL. We look forward to an afternoon of pleasant music with, we’re sure, a hint of romance, and who knows, we might even find love! But if not, we will at least find tea, cake and good company, and we can take comfort in the knowledge that as well as being the patron saint of courtly love, St Valentine is also the patron saint of beekeepers and protects against plague.